Pneumatic forklift tires are very similar to the heavy-duty tire found on highway trucks. Filled with air, they have deep treads and are made of long-lasting rubber. Some of the heavy duty applications have the pneumatic tires filled with liquid polyurethane foam instead of air. A pneumatic forklift tire extends the useful life of the forklift because of this added protection. This is the primary tire for use in heavy duty, rough outdoor applications. The solid rubber forklift tire is very similar to the pneumatic, but without the cushion the air provides. They are normally solid rubber built around a metal band. Ironically, on forklifts, these are sometimes called cushion tires because they provide a cushion of solid tire between the load and the surface. A solid forklift tire will last a long time; the trade off is the lack of protection for your equipment. There are some standard solid tires, but they are normally manufactured as a press on tire. The polyurethane forklift tire is a lightweight option that provides good traction with low rolling resistance. These are tires most often found on electric, indoor use forklifts. They can carry more weight and this is a consideration in balancing the weight of batteries. Polyurethane forklift tires are considered to be a press on tire. The specific application (and location) will determine which forklift tire is best for the job. However, many forklifts are designed for specific tire types and their use is not interchangeable. The table above indicates some of the trade offs. Outdoor forklifts involved in heavy duty use require the traction and height of pneumatic tires. On the other hand, smaller electric forklifts that are used in narrow aisle applications will use the polyurethane tires for small turning radius needs and smooth rolling traction. Another consideration for large facilities that have a forklift tire press is what type and size tires it is able to handle. Buying a new forklift tire press will cost a few thousand, but usually local forklift dealers will have mobile tire presses (van mounted) so you do not need to make the investment on your own. While there is a wide crossover between lifts, tires and uses, the extremes are clear. For rugged outdoor applications, only pneumatic tires are a good option. For indoor, narrow aisle warehouses, the polyurethane on an electric truck will generally be the best choice. Visible wear and tear - Is the rubber worn flat? Is there any frayed metal poking out to indicate significant wear? Brand - If the owner replaced old tires with a cheap brand, they can wear down over twice the speed of top brands. Capacity - the pneumatic tire generally allows a greater capacity. Surface - cushion and polyurethane forklift tires require smooth surfaces. Forklift life - pneumatic tires are the best for extending the life of any forklift, particularly in heavy duty applications. Use determines actual time at tire will last. However, solid tires generally outlast pneumatic by two to three times. 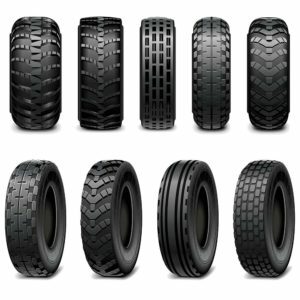 While there continues to be major advances in forklift design and technology, these three tires and their variations continue to be the way forklifts roll now and in the foreseeable future.